in Social Media with tags community management, content marketing, Facebook Both comments and trackbacks are closed. For years, media buyers have been using sophisticated technology to target messaging to specific audiences and improve performance. Community managers haven’t had this level of capability within Facebook – at least, until now. Last night, the Facebook Developer team announced a brand new feature for pages called ‘enhanced post targeting,’ which stands to have a direct and important impact on a brand’s social strategy. This is one of Facebook’s biggest announcements to date, as marketers now have the ability to speak differently to specific subsets of consumers through earned media. While brands generally have identified targets – groups of consumers who engage with their brand most – the entirety of marketer’s audience is much broader than that. Prior to this update, community managers had no way of tailoring content to specified groups beyond region and language. Now, a CPG brand whose primarily audience is moms can also create a parallel content strategy for Millennials. The implications for community management and content strategy are huge. Community managers can now create and serve content that will appear in the individual Newsfeeds of a more narrowly-selected subset of its fan base. New targeting options include gender, relationship status, education, workplace, language and geography. With Facebook’s former language and geo targeting, targeted posts only appeared to people who fell within that range of the target, and no one else was allowed to see the post. Now, targeted posts can be seen by all users on the Page in the Timeline (so don’t go overboard with too many posts at once), but only reach targeted users in their own Newsfeed. The concept is similar to Google+ Circles, which enable admins to segment followers into various buckets. The key difference is that within Facebook marketers won’t have to assign fans to buckets – they will already be in them based on information they provide in their profile. Of course, within Circles marketers can get even more granular in terms of segmenting their audiences. This update gives marketers the ability to boost social engagement by crafting more detailed and sophisticated content calendars that are tailored to the nuances of their brand’s audience. With more sophisticated content strategies will come greater engagement, as marketers will be hyper-relevant to the behaviors and preferences of various consumer groups. How each page should approach this update will vary – brands with truly multifaceted audiences will see the most opportunity, while those with more homogenous audiences might choose to keep their current approach. Of important note is that ALL content will still remain visible on the Page’s Timeline, allowing for friends of engaged fans who are not within the targeting parameters to see viral stories. That said, to avoid clutter admins can ‘hide’ targeted stories from the Timeline by clicking the pencil at the top right corner of the post. Facebook says that it is just beginning to roll out the enhanced post targeting, and currently only 1 percent of pages are seeing the update. 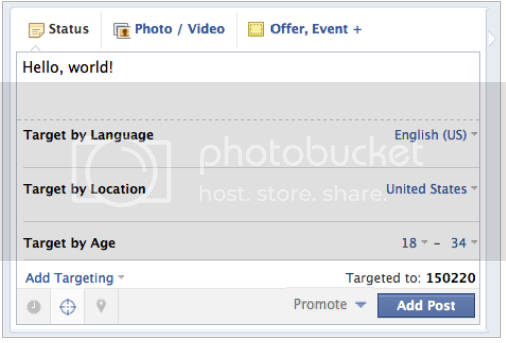 In just a few weeks though, every single page on Facebook with more than 100 fans will have this functionality. It is presently available to 100 percent of Pages via the API.